URBANA, Ill. - The Academy of Nutrition and Dietetics celebrates March as National Nutrition Month® to promote healthy eating and daily physical activity to attain and maintain optimal health. Laura Barr, a nutrition and wellness educator with University of Illinois Extension explains that the 2018 theme, “Go Further with Food,” is a two-fold message focusing on choosing nutrient-dense foods for energy and planning meals and snacks to decrease food waste. “Go Further with Food” is a reminder to eat a variety of fruits, vegetables, and proteins, as well as whole grains and low-fat dairy products or other calcium-rich foods. This diet is recommended by the United States Department of Agriculture’s Dietary Guidelines for Americans, designed to help consumers eat for health benefits in accordance with their energy needs. “These messages are also an important part of U of I Extension’s nutrition and wellness programs, which deliver evidence-based nutrition education and safe food handling information to the public, “Barr says. “After attending nutrition and wellness programs, participants make healthier food and activity choices, decrease food waste, and may have less incidence of food-borne illness. “Physical activity and healthy eating are the power twins for strong bodies. Adults should get at least 150 minutes of physical activity per week, while children ages 6-17 need 60 minutes per day. The key to consistency is finding activities that are enjoyable, and schedule them in your calendar,” she adds. About three-fourths of the population has an eating pattern that is low in fruit, vegetables, dairy, and oils. More than half of the population is meeting or exceeding total grain and total protein foods intake, but would benefit from increasing the variety of foods consumed within these food groups to improve their nutrient intake. A variety of vegetables from all of the subgroups— dark green, red and orange, legumes (beans and peas), starchy, and others. “Go Further with Food” also addresses food waste management. The Journal of Nutrition and Dietetics published a study, based on the data of 2012 USDA statistics, which revealed that 31 to 40 percent of our food is disposed of after it’s harvested. “This practice is on the front end of the food line,” Barr says. 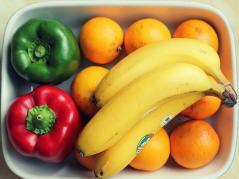 The federal government’s goal is to reduce food waste by 50 percent by the year 2030. “On a personal level, consumers are advised to shop with a game plan to reduce waste. This includes reviewing ‘in stock’ items on your cabinet shelves or the refrigerator, so that repurchasing isn’t necessary,” Barr explains. “Next, consider the meals you will prepare. Purchase what you need to eat fresh or freeze for a few days, then plan on how to use leftovers later in the week. It may take extra effort in the beginning, but this practice will reap monetary rewards in the long run.